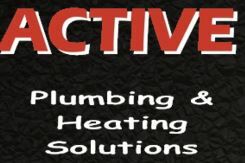 Active Plumbing - Central Heating Engineer, Plumber based in West Molesey, Surrey. Invoice history based on 124 reviews. Locally based in Molesey, Surrey since 2010, we undertake gas and plumbing work, covering all areas within the county of Surrey. We pride ourselves on providing a great service with competitive prices, from fixing a kitchen tap to installing a boiler to a complete bathroom refurbishment. We consider no job too small and always strive in doing the best possible work no matter how big or small the job, providing our customers with a service second to none. Landlord Gas Safety certificates , boiler installations, hot and cold water, central heating systems and ALL GAS WORKS, we do it all, so call us today for an expert service at very competitive prices. We are of course happy to visit you initially at no cost to chat through your job and give you a free quote.